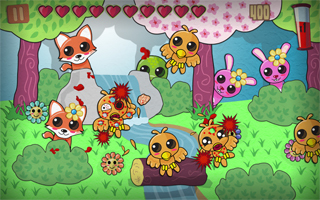 Davy, our young hunter, has been overcrowded by cute animals, methodically killing each one of them. But another great menace watched over him from the skies. Imagine dozens of birds flying at you, as if Alfred Hitchcock himself was hiding in the woods. Davy’s old shotgun is rusty and slow to reload, so he opted for a new toy: the Gatling gun. Its cyclic multi-barrel will create some new holes in these birds. Just touch a bird, follow its movement and watch bloody feathers fall graciously. And it’s not over yet! When the night comes, the bat wakes up and wants to play too. No, it’s not a disguised billionaire going out at night to beat clowns, but an authentic chiroptera. 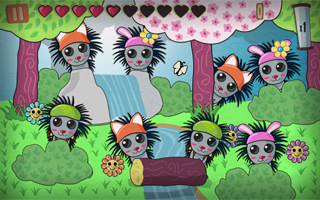 Davy, as all the members of Tabemasu Games, has received ninja training. So he knows how to handle shurikens, and he has plenty of them! Just swipe your finger onto the bat to slice it! See you next week for new adventures (and Happy New Year)! In every video game, there’s a huge, scary, and heavy beast blocking the path: the boss. 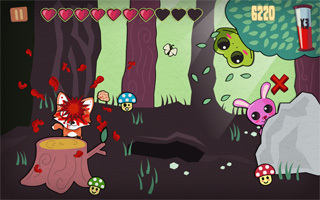 In Kawaii Killer, the first boss is the wildboar. Do not be fooled by its cute face and big round eyes, this one has a hard head and won’t let you go easily! What can Davy use on this beast? A pneumatic drill of course! To use it, just tap madly on the wildboar. Once he’s suffered enough, he’ll hide to come back later with his friends from the forest. 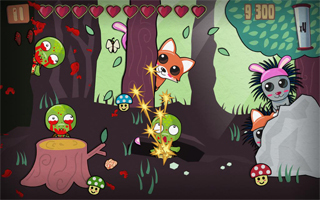 The more you hit him, the more animals you’ll encounter, so be quick to finish him! See you in two weeks for two brand-new animals, and next week for a little surprise! Let’s go further into the woods, and meet the tortoise with its strong shell. You need to be stronger against it. Let’s see… A chainsaw! Keep your finger on it and you’ll be able to see sparks coming out of its shell, followed by a beautiful explosion of blood. But keep your eyes on the other animals, because they’ll keep coming, even while you break tortoises’ shells. You have more than one finger, so use it! And here comes the trickiest animal of all: the porcupine. Don’t even try to kill it, each attempt will make you lose a heart. Just let this spiny problem go away, and unleash your anger on the other animals. But know this, this porcupine likes to dress up as other animals! Beware of fox and rabbit ears coming out of bushes, it may be a porcupine! 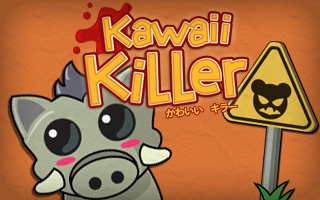 See you next week to see which animal is the first boss of Kawaii Killer! Our young trapper Davy will have a lot to do with those two! 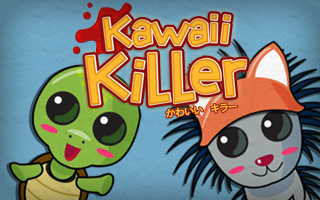 Those are the first animals encountered in Kawaii Killer, ready to jump out of their holes to meet their fate. 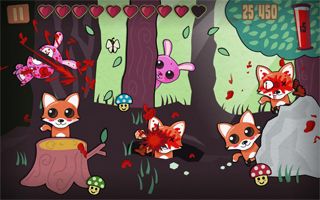 To hunt the fox, only one method, quick but efficient: tap on it with a hammer! 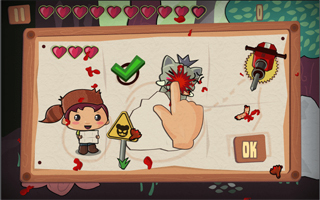 Don’t rush to your toolbox right away, a simple quick tap on the screen will suffice to put the poor fox out of its misery. But don’t think it’ll be easy, because while time passes, the fox pack grows and more and more foxes will appear! 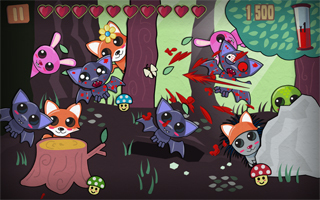 And you’ll lose a heart for each fox escaping your hits. For the rabbit, be ready to unsheathe your katana! Simply swipe your finger on it and watch it be sliced à la Kill Bill. But be careful, if you try to tap the rabbit like it’s a fox, you’ll lose another precious heart! 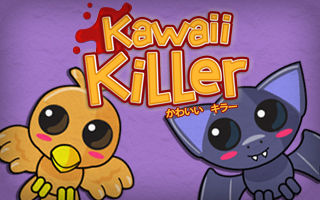 See you next week for two new cute animals! 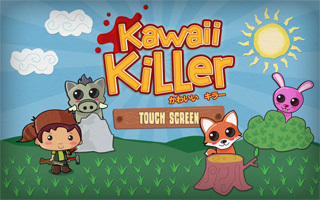 Tabemasu Games proudly presents Kawaii Killer, the unforeseen reunion of Hello Kitty and Mortal Kombat, in a game for iOS / Android / Windows Phone 8 Tablet computers and Smarphones. The goal is simple: you are Davy, a young trapper walking in the woods. 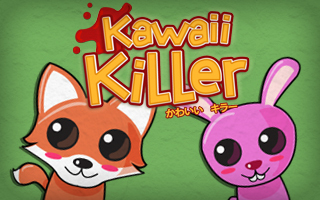 You’ll meet a whole bunch of cute animals that you’ll have to kill restlessly. But beware! Each animal is special! 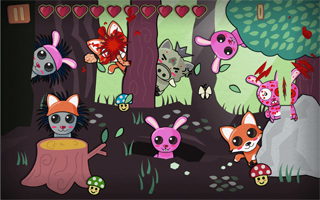 If the fox needs only a simple tap to be killed, you’ll have to perform a slice to kill a rabbit, while the frog needs to be torn apart using two fingers! 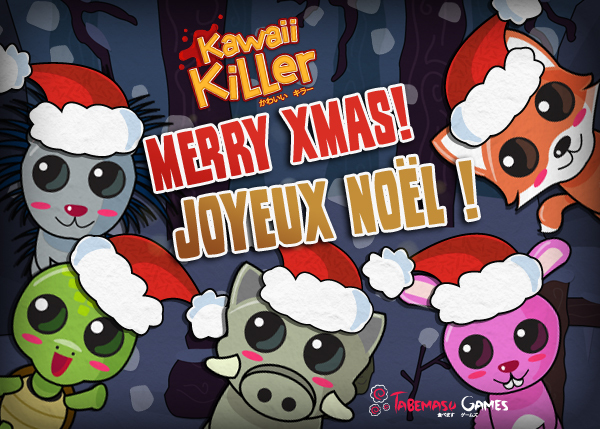 While you wait eagerly to play this game planned for first half 2014, we’ll present you a new animal each week, so stay tuned! Last week, I participated in the fourth Game Dev Party, a game jam based in Lyon, France, in which you have to create a game in one weekend. I went to the 3 GDP jams before that, and each time, I come with a game concept, because I love creating new gameplays and try innovative ideas. This time I wanted a dual-stick controller based gameplay. By that, I mean a gameplay that is the most efficient with this kind of controller. 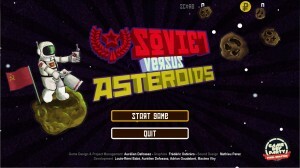 And this idea lead to “Soviet vs Asteroids”. 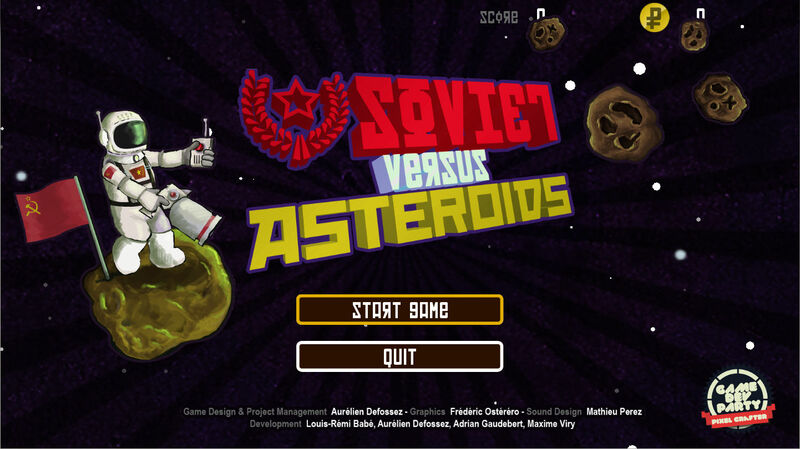 In Soviet vs Asteroids, you control a lonely sovietic cosmonaut standing on a rock in outer space, who tries to survive against a bunch of asteroids. To stand against these, the cosmonaut has only two weapons: a missile launcher to hit big asteroids and a laser controller to fire lasers at smaller and nearer asteroids. This is where you’ll see if your Kawashima brain training was successful. You control the missile launcher with the left stick and left bumper (LB), and the lasers with the right stick and right bumber (RB). 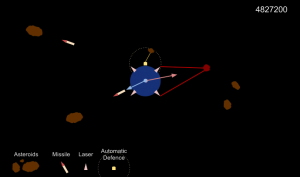 And from there, you should try to optimize your shots by aiming at the biggest asteroids with your missiles while destroying the small ones using the lasers. 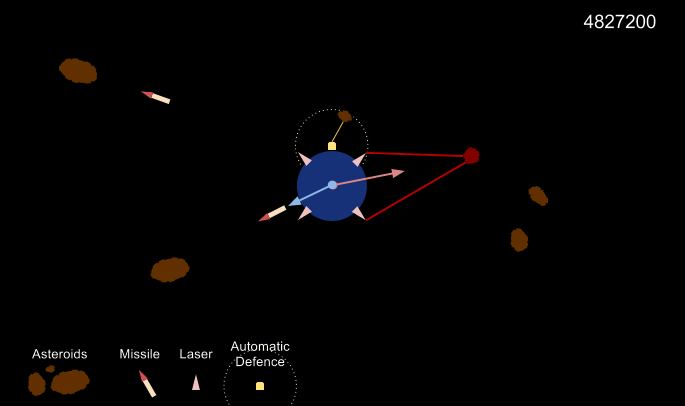 When you destroy asteroids you gain money, with which you can buy upgrades to improve your missile launcher, add more lasers, or add new defence drones (which are automatic defences that attack anything passing by). If you’re swarmed by asteroids, you can shout “Fus-ro-dov” (in the game I mean), which clears the screen of all asteroids. It looks easy? It is not. Try it, the download links are at the end of this article. If you achieve a high score, don’t hesitate to send an email to contact@[website url], with a screenshot of your performance. I’ll try to break your record if I can. If you want to see me playing the game first, you can watch this video. One more game in the bank! So, today is the release of the game. I’m happy I can say I managed to create a game people like (well, at least the few that played it as of today). I was thinking about sitting aside and let others take my place in the next GDP jam, but I love these jams so much that I think I’m gonna participate in the next! It’s so thrilling to see what we can achieve is such a short time. The concept gameplay I presented to the team. Graphics aside, it’s really close to what we have in the end. I always have a tremendous team following my ideas almost blindly, and for a game designer like myself, it’s awesome! Sure, we changed some stuff, the game is not exactly as I imagined it because others may have developed something different than what I imagined, and it sometimes improves the gameplay and the user experience. 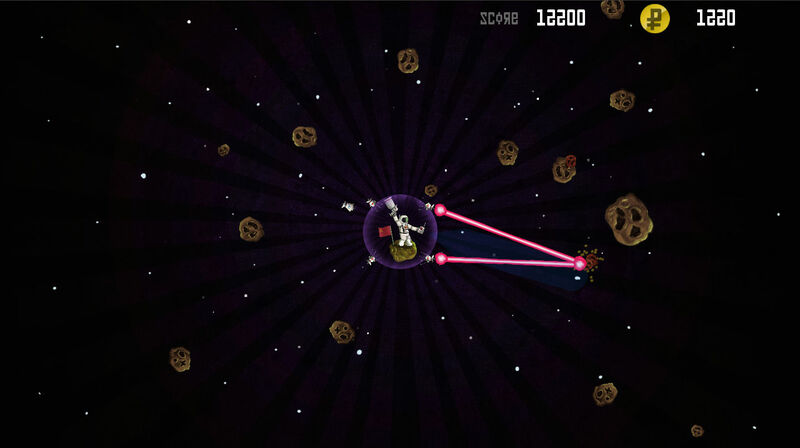 For instance, for this game I imagined the asteroids to always move towards the player, never missing it, but Louis-Rémi did not implement it this way, and it added a new dimension to the game. Instead of having to destroy every single asteroid on sight, the user has to choose which asteroids he must destroy in order to survive, and he can destroy more if he wants to earn extra money and points. I don’t know if he knows he improved the gameplay, I don’t know if it was intentional or if he just misunderstood my point of view, but the result is that the game was improved by this small change. If you’re interested in the source code, the project is hosted on github. A big thank to all the crew who made this game, Frédéric Ostéréro for the awesome graphics, Mathieu Perez for all the sounds and musics, and Louis-Rémi Babé, Adrian Gaudebert and Maxime Viry who developed the game with me. 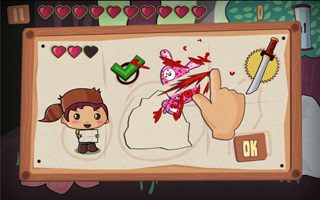 An additional thank to Fred, which made some final touches in the graphics after the week end, and Adrian, who helped me to fix the last bugs, balance the game and prepare this release.